Four years ago, Ralph Fiegel made the decision to slow his life down. A graduate of the Culinary Institute of America, Fiegel spent nine years working for the Barbara Lynch group, holding the position, among others, of executive sous chef at No.9 Park. But after long nights spent in cramped, sweaty kitchens, he was ready for a change. 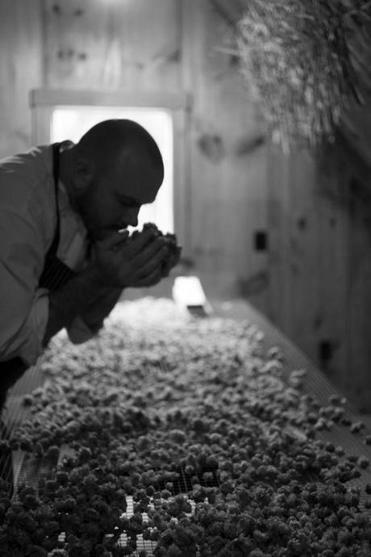 Elliott and his team put the produce to use, incorporating it into Saltbox Kitchen’s restaurant and catering offerings. Before long, Fiegel was asked to showcase his culinary skills one more time, but not in the kitchen. Fiegel planted hops — nine plants at first, then 20, then 30. This year, there are 75 hop plants growing at Saltbox Farm, trying to establish themselves to eventually yield enough of the piney flowers to flavor the entirety of Fiegel’s beer output. For now, Fiegel is making small batches of beer with whatever he can use on the farm. That includes an IPA with a field blend of last year’s hop crop, and a Belgian witbier with dried coriander. This fall, he’ll roast and mash Kabocha squash to make a modified pumpkin ale. Fiegel gets excited when talking about getting the farm ready for even more brewery incorporation. “The cilantro when it goes to seed, right before it dries out is a nice berry quality,” he says, adding,. “What we’re doing stylistically is what’s going to work well with the food. Saltbox currently has four beers on tap — Saltbox Prophecy Farmhouse Ale, Heywood’s Ordinary Belgian Wit, Top Bracket IPA, and Emerald Prophet Pale Ale — named for the horses that once belonged to the farm. The beers are available on site, served in a flight or in pint glasses, and in 32-ounce growlers to go.